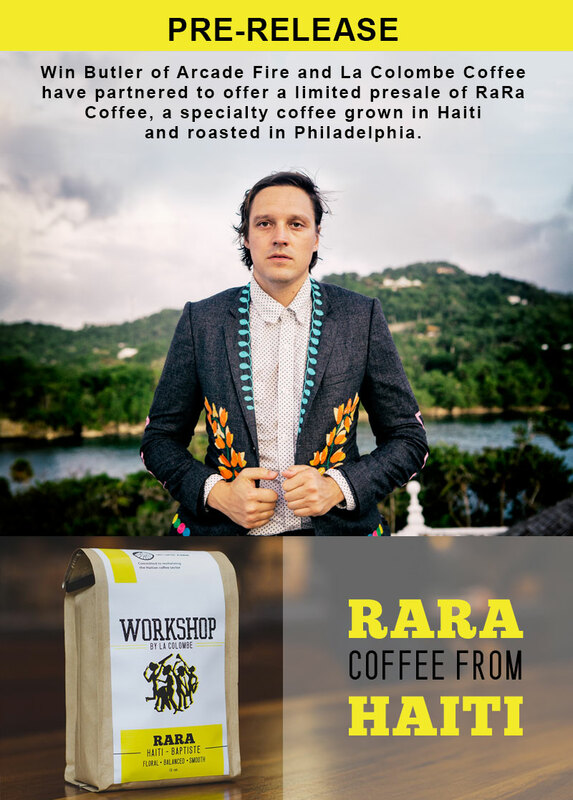 We are very excited to announce a partnership between Arcade Fire’s Win Butler and La Colombe for the limited presale of RaRa Coffee, a specialty coffee grown in Haiti and roasted in Philadelphia. Named after a form of festival music that originated in the Caribbean country, RaRa was created to support health and agricultural initiatives in Haiti. Proceeds from the sales of this coffee will go to support Partners in Health and Haiti Coffee Academy. It will be available at our online store while supplies last! Being in the mountains of Haiti, it is hard not to think about coffee. The elevation, the sunshine, the soil, and incredible people, who have been growing the plant on tiny family plots for centuries. Haiti is buzzing with potential and possibility, and coffee can be an important part of its rebirth! I’d heard about what La Colombe was doing with their coffee academy so I approached them to see if they’d make this coffee for me, because coffee is so important to Haiti, and Haiti is so important to me and everyone in the band. Really happy to share this with you, especially with all the funds going to Partners in Health, The Coffee Academy and Haiti.